On Tuesday, i lost to Rob, with the white pieces, in our second game of the CCs Major Section. At 62 moves, however, i made him work for it. I had prepared the Austrian attack against his Pirc Defence. dxc5 8. h3 Nc6 9. e5 Nd5 10. Nxd5 Qxd5 11. c4 Qd8 12. O-O f5 13. Re1 Nb4 14. Bb1 Be6 15. a3 Qxd1 16. Rxd1 Nc6 17. b3 Rfd8 18. Rxd8+ Rxd8 19. Bc2 Nd4 20. 27. gxf4 Bc8 28. Kg2 Bb7+ 29. Kg3 e6 30. Bc4 Bd5 31. Bxd5 Rxd5 32. c6 Rd8 33. Kf7 40. Ke3 Ke7 41. Bb2 Kd7 42. Bc1 Kc6 43. Kd3 Kb5 44. Kc3 Bf8 45. Bb2 Bc5 46. 53. Bc1 Bd4 54. Bd2 Bb2 55. Bb4 Bc1 56. Bd2 Bxd2 57. Kxd2 Ke4 58. Kc3 Kxf4 59. Gary and Pete were also around, but lots of people are away at the moment. Now Dave, let's see your defeat against Ray. Lots of people are still away next week - including yours truly, but Dave and Guy will be playing at the Heathcote on Tuesday 3rd. There are CCs games at Wigston on Thursday 5th. The following week, we have Brian, a new player (to us anyway), coming down to Club Night on Tuesday 10th, and HA2 play away at Wigston on Thursday 12th in the Semi-final of the Chapman Cup. These are gradually starting to appear. Check out the gradings page on this site. Despite some strife in getting a side together to play this match, a full team was fielded on Thursday evening at Wigston. Due to a quirk in the League's allocated grading Alan Goodwin's grade was 85 and hence he was on Board 3, above Ray. Graham Booley won his first game against Neil Beasley playing White, and although I sitting next to him I couldn't tell what happened, although it was over fairly quickly. Playing Black on 2 I gave up an exchange to ease the pressure, and then made rather a stupid move (placing my Queen in front of a Rook) and so I lost. On Board 3 Alan was in serious attack mode, but by the time his flag dropped he was material down. On the bottom board Ray won on time, although his position was also better. For the reverse games Graham won again. I initially went a piece up, but then allowed a Knight check which forked my Queen, so I lost in pretty rapid order. Alan lost to his much higher graded opponent. Everything then hung on Ray's game - at this stage he was in a two Rooks & Pawn versus Rook, Bishop & Pawn endgame, with the same number of pawns. Somehow Ray's Rooks didn't get connected, and then one was pinned to Ray's King by the Bishop, and lost. In the end Ray's opponent ran out of time, but by this stage Ray only had a King, so the game was drawn. Frank Hulford (114) - Ray Beach (77) 0-1, 0.5-0.5. So we lost 4.5 - 3.5. Thanks to Graham & Alan for stepping in at short notice to ensure we got a side out, and congratulations to Ray on an outstanding performance against a higher graded opponent. Realistically, given that we've lost two matches, it is reasonable to say that the Harrod Cup won't be coming to the Heathcote Arms this season. On another issue, it seems a strange statistical quirk that seven of the eight players playing had surnames starting with the first eight letters of the alphabet. Is there a correlation between the initial letter of surnames and chess playing? On Tuesday, Ray, Dave, Pete, Rob and myself were at the Heathcote. Welcome to Gary who looked at our website and still came down anyway. Gary has recently taken up chess and has so far been playing online. With our decision to enter a third team in the league, his timing is perfect. The evening started off when Dave insisted that we play through my game from last week against Guy. This provided a lot of amusement. Despite what i said about not posting this game on the site, however, I will if Dave puts on his recent game against Ray. Whilst Dave and Gary, and Pete and Ray played some friendlies, Rob and i got down to our first of two County Championship games against each other. 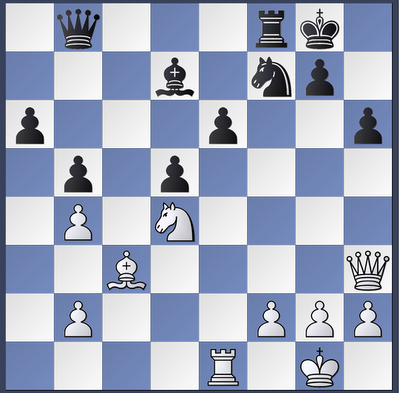 We were playing the Nimzo-Indian defence when Rob played the unusual move 4. Bd2. Fortunately, i had been reading about this variation the night before. The book i had been reading said that it was rarely played and suggested 4... c5,d5, or 0-0. This helped me survive the opening. Later, although a pawn up, my position looked less good after 40...a6 (Fritz gave Ke6 as the far better move). And soon after Rob accepted my offer of a draw. On Thursday 22nd, Dave captains our Harrod Cup team away at Wigston. Good luck, chaps. On Thursday, it is the Open and Major sections of the County Champs at Wigston. Rob and i are due to play our second game, but i could be convinced to play this on the Tuesday at our place. On Thursday, Ray had a bye. I played with the black pieces against Guy Closs. It did not work out well, however, as i was in serious trouble by move 14 and resigned on move 17. Andy Morley, who had been watching, accurately described my game as a car crash. On this occasion, i cannot bring myself to post the moves, or even just the Fritz comments. Haka Dave had a far nicer time with a well won endgame victory against Stan ' the man' Parsons. Next Tuesday, we have a new player coming down (Gary, who saw the website). On Thursday, HA2 will play in the Harrod. Dave is struggling for players so please contact him if you are available to play and are eligible. A decision not to merge with the Red Admiral. An increase in annual membership subscriptions to £30 for adults and £20 for juniors with a £5 discount for both if paid before the end of August. Committee members to remain the same. To enter a third team (in the bottom division). To enter one team in the Major League Cup, and one Team in the Minor League Cup. Team Captains to be Graham B (HA1 in Division 1), Pete Harrison (HA2 in Division 4), and Colin Ross (HA3 in Division 5). A change in the name of the Club to Blaby District Chess Club at the Heathcote Arms for the purposes of the website - still to be the Heathcote Arms in the fixtures pages of the handbook. To perform an audit of our equipment so that we can establish what we have and what we need. HA2 Succeeds in 2nd Round of Chapman Cup. Having had a bye in round 1, we were drawn away against Market Harborough for the second round. A grade difference of 67 meant that we had a bonus of 0.5 points - this would have been 1.5 points if the differential had been 75 or over. MH won the toss and chose white on even boards. The first result was a draw between Pete and Romily, this was followed by a draw between Haka Dave and Robert King. I had been in a very drawish position against Charles Oppenheim and entered into a knights and pawns endgame - i blundered a pawn and attempted to set up blockades against my opponents queenside pawns with my knights. Meanwhile Ray had been involved in a streetfight with Sean Kennedy - Sean had turned down Ray's offer of a draw and shortly afterwards Ray mated him. Afterwards, Dave summed up Ray's performance rather well: 'He is like something from a horror movie. He keeps coming at you because he doesn't realise he is dead'. Ray's win put the match out of Market Harborough's reach and so Charles offered me a draw which i accepted. No losses and a won match against the team that put us out of the Chapman Cup in the Semi-finals two years ago. The AGM will be held at the Heathcote Arms at 7.30PM on Tuesday 13th July. Please forward any items for the agenda to me. In the coming week, HA1 will be playing a Wylie Cup match, at home on the Tuesday 6th. On Wednesday 7th, HA2 play away against Market Harborough in the Chapman Cup. After 28 moves, thinking that i had a slight advantage, i offered David a draw. He considered for a while, but then played 29 Nxe6. Play then continued 29...Ng5 (which seemed to take David by surprise), 30 Qg4 Rf7, 31 h4 Nxe6, 32 Rxe6 Qc8 and then white resigned faced with the prospect of losing his rook. The was my first ever non-loss against David.